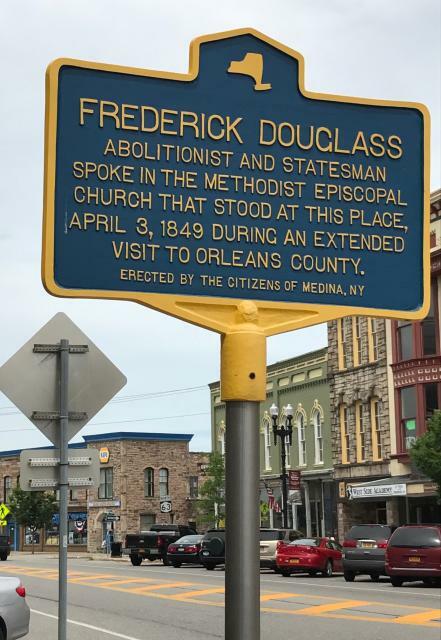 [south side]Frederick Douglass abolitionist and statesman spoke in the Methodist Episcopal church that stood at this place, April 3, 1849 during an extended visit to Orleans County. [north side]Frederick Douglass delivered a renowned address in Medina entitled "We Are Not Yet Quite Free," August 3, 1869 to African-Americans gathered from across New York State. This marker can also be identified by its HM code. You can use the hashtag #HM1KGJ in tweets, and any other place where you might refer to this marker, including when searching on this site.